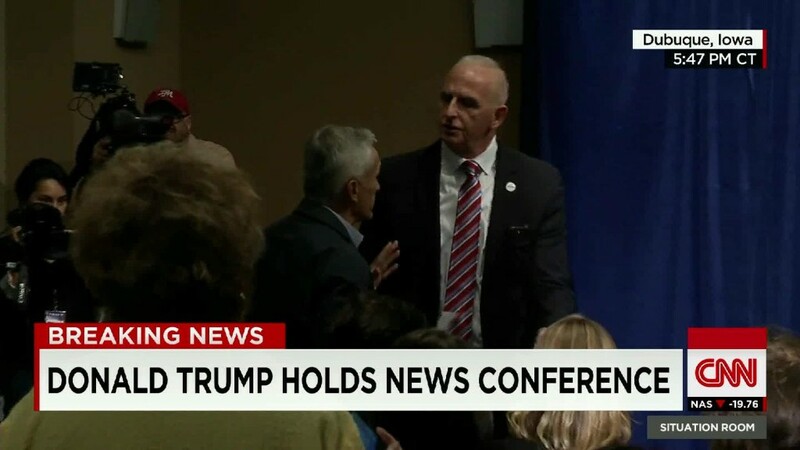 "Go back to Univision," Donald Trump said when Univision anchor Jorge Ramos tried to ask a question at a Tuesday evening press conference. Ramos wasn't altogether surprised when a security guard escorted him out of the room. In fact, he wasn't sure if he'd be allowed into the press conference in the first place. The two men have a complicated history. Ramos, who is bilingual, is often said to be the most famous Spanish-language news anchor in the United States. He is known for his confrontational interview style. And he has been trying to get an interview with Trump for months. Earlier this month, on CNN's "Reliable Sources," Ramos said to me, "I don't understand. Is he afraid of talking to me, is he afraid of talking to Univision?" With Trump's immigration plan stirring controversy, Ramos decided to travel to Iowa for Trump's Tuesday evening rally there. His flight landed around lunchtime. Ramos and his colleagues thought he might be blocked from entering the pre-rally press conference, but he wasn't. Once inside, Ramos decided to stand up and ask a question without being called on. "You haven't been called," Trump responded, before saying he should go back to Univision. Trump also asked Ramos to "sit down, please" before security intervened. "After two or three questions I thought it was my turn and my right to ask a question," Ramos said afterward. He called it "the first time in my life, anywhere in the world, in which I have been escorted out of a press conference." After security "pushed me out of the press conference," Ramos said, "I stayed outside the room and after about maybe 5-10 minutes, somebody from his team" invited him back inside. Trump debated him for about 5 minutes. It ended with Trump saying, "You and I, we'll talk." Ramos anchors the nightly news on Univision, reaching millions of Spanish-speaking viewers, and also has an English-language program on a cable channel called Fusion. He is outspoken about the importance of the Hispanic electorate. And he has tangled with Trump before. In June, Trump published Ramos's cell phone number to prove that Univision was "begging" to interview him even while canceling the Miss USA telecast, which Trump partly owns. Ramos has also assailed Trump's rhetoric about immigration. On "Reliable Sources," he said, "I think Donald Trump is the loudest voice of intolerance, division and hatred right now in America. What he is saying about immigrants and women is not only disgraceful, but dangerous." Monday night, Ramos said on CNN that what Trump "is trying to sell to the American public simply doesn't work. How is he going to deport 11 million people -- by bus, by plane? Is he going to bring the army to do that? Can you imagine the human rights violations that it would create?" Ramos's point-of-view journalism is hailed by some and criticized by others. He positions himself as an uncompromising advocate for his audience. 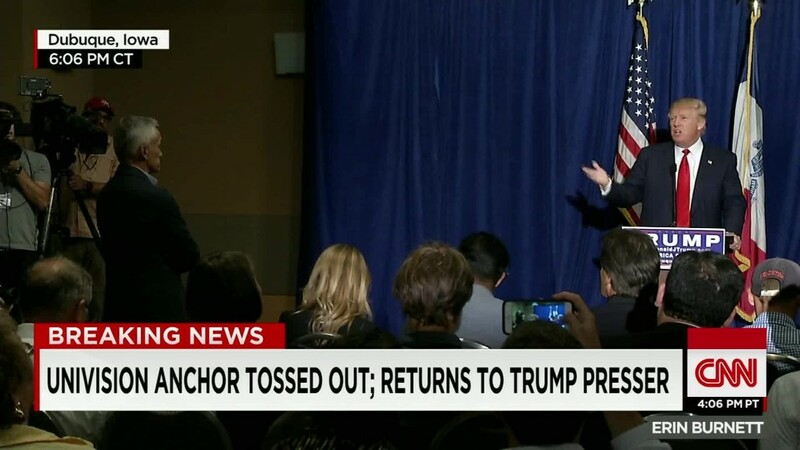 Unsurprisingly, there were a wide variety of reactions to the press conference, with condemnations of Trump competing with headlines like this one from the conservative site National Review: "Donald Trump Was Right to Kick Jorge Ramos Out Of His Press Conference." Trump can be blunt and even nasty with journalists who challenge him. Earlier this week he touched off a new battle with Fox News for resuming attacks against host Megyn Kelly. And earlier this summer he barred an Iowa reporter from his rally because the reporter's newspaper said Trump should drop his campaign. Trump is suing Univision for $500 million over the channel's decision to cancel its airing of the Miss USA pageant. Univision dropped the pageant to protest Trump's remarks about Mexican immigrants being criminals and rapists. Trump mentioned the lawsuit while debating Ramos.